Take a trip back to the 1980s with this psychedelic battle against your own reflexes. Hello! I’m Vladimir, a game designer at the studio Fraoula. We’ve been hard at work to bring our newest game Neon Drive to PS4, and I’m excited to announce it will hit Playstation Store on August 8. Neon Drive is a journey back into the 1980s – a time when people still wrote letters, and when they thought — as Douglas Adams put it — that “digital watches were a pretty neat idea.” To be fair, back then we were secretly expecting to have robot coworkers and drive flying cars by the year 2000. The 1980s were also a time of the first computer music — digital synthesizers were all the rage. Computers made simple games possible, and game designers started exploring new genres such as racing, lane dodgers, top-down shooters, side-scrollers, and platformers. But back then the equipment was not cheap — you had to go to the arcades to play the best looking games, which were often so challenging that you had to spend dozens upon dozens of coins just to complete a single level. Neon Drive takes all this and blends it into a nostalgic love letter to the ’80s. With a couple of exceptions, though: you won’t have to go to the arcades every time you want to play, and neither will it cost you an arm and a leg. Au contraire, once you purchase the game, you’ll have all the time in the world to finish it. You’ll even get a complimentary dynamic Theme for free! 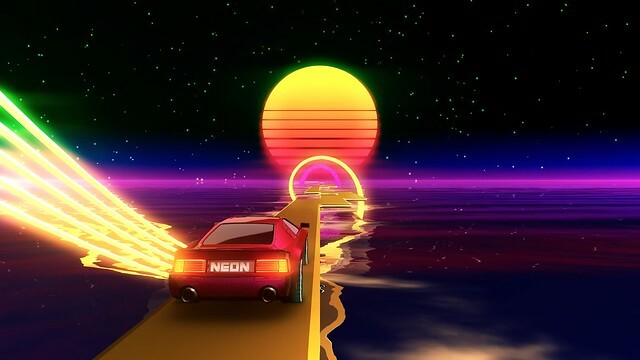 Neon Drive brings you eight levels, each with a unique theme and a surprising twist in the gameplay. Using a two-button control scheme, you’ll have to make your car avoid oncoming obstacles, timing your moves to the rhythm and melody of an awesome custom-made synthwave soundtrack, composed and produced by Gustav Eriksson Pengus. Now I suggest that you simply take a deep breath and relax. It will help you sharpen your senses and prepare you for a battle with your own reflexes that you won’t soon forget. loved playing this on the ipad, defo gonna pick this up on ps4. have you added to the soundtrack in this version? Thanks! Glad to hear you liked it. We’ve added the new Level 8 music to the soundtrack. Watched the two trailers on steam. Wow. My brain is melting!!! 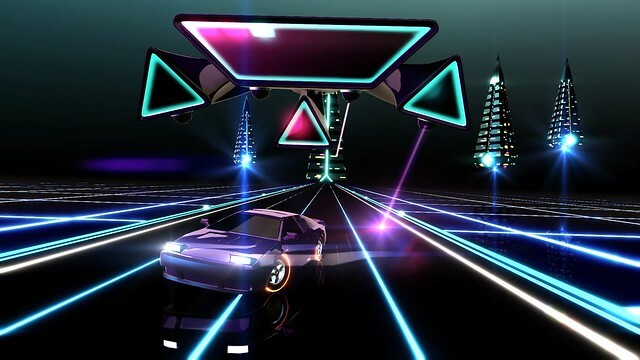 This game looks really cool and I’d like to make a suggestions to studio Fraoula, how about making a Top Gear-like game with this theme, Neon “Top Gear” if you will. Thank you for the suggestion! I hope we’ll get to make our next game soon. Looks cool, but more importantly how’s the soundtrack? Indeed…That would be awesome with the poppy color scheme. I’d dig it. Oh gosh, this sounds real good. I’ll check it out, maybe even buy it. And.. you know.. maybe have a dlc with a Kavinsky song? It would be amazing. Love this game! Played the **** out of this game on Steam; love playing the hard mode. Very excited to see this gem porting over to the 4. Any VR plans? I’ve been blown away by Thumper in VR, want more. also I’m checking out game play on youtube the soundtrack is awesome. Currently, there are no VR plans for Neon Drive. But we do get asked that question a lot. How much is this game gonna cost on launch day? I’ll wait for the switch version. I want to play this on the go. Will the theme be available for sale separately? This game looks like a whole lot of fun. Can’t wait to play it. This would look amazing in VR!